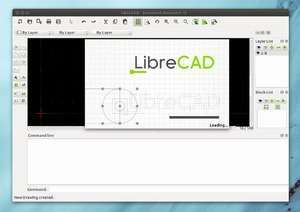 LibreCAD is a free and open-source program for editing and viewing technical sketches on your computer and provides many functions for 2D design schemes. The program includes many different drawing tools for 2D designs and can provide a perspective from almost any angle. Completed files may be exported as PNG, TIFF or JPG format while also supporting PPM, XBM and XPM files. Like most other 2D CAD programs, LibreCAD can also support elastic curves, lines of different sorts and a variety of dimensioning tools. For security reasons, you should also check out the LibreCAD download at LO4D.com which includes virus and malware tests. Additional screenshots of this application download may be available, too. LibreCAD download been highly rated by our users.